Can’t Play AVI Videos on Philips TV via USB? We have many ways to play video on Philips TV. Streaming video via USB port is one of the ways. When playing video on Philips TV via USB, many people meet the same problem that Philips TV say that AVI files can’t be recognized when they play them on Philips TV. "when i play media files (AVI format) through my USB flashdrive using the USB input of TV, after around 4 mins the picture judder starts and also the audio goes a little out of sync. It is quite unpleasant to watch." "My Philips TV only plays some of my AVI files but not others via USB drive." Why is Philips TV not able to recognize AVI through USB flash device? NOTE: Not all USB flash drives are recognized by your Philips TV. Only memory cards in FAT/DOS format are supported. Portable hard discs are only supported as a mass storage device without any multimedia capabilities. If your portable hard disc comes with multimedia capabilities, you have to connect your hard disc as a standard peripheral device. Your TV supports playback of files in JPEG (Photo) and MP3 (Music) format exclusively. 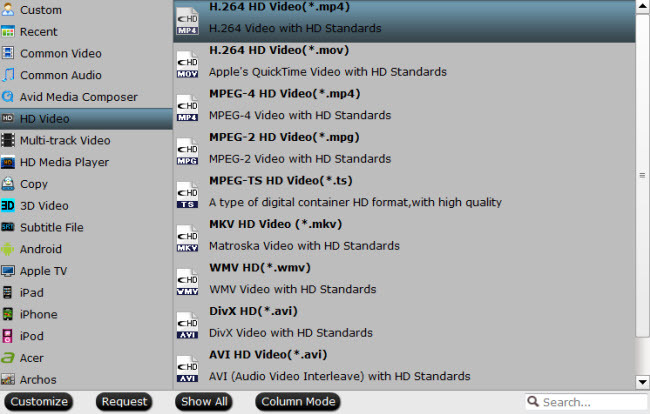 Video files such as AVI, MPEG4, MKV, etc. are not supported. Make sure that your TV has the latest software installed. You can find the latest TV Firmware Upgrade Software and Readme File documents on the Philips support website. Refer to the SOFTWARE & DRIVERS section. Follow these steps below to check if your USB flash device is supported. Insert your USB device into the USB connector at the side of the TV. The BROWSE USB icon will be shown on the home menu if the TV recognizes the USB flash device. Note: If the TV does not recognize the USB flash device, try re-inserting the USB flash device and repeat the procedure again. Select the BROWSE USB icon and press the ‘OK’ button to access the content browser. To view the media files that are stored on the USB flash device, select the folder of your choice and press the cursor right to browse through the contents. Large files or files from high capacity USB drives can take a little longer to load in thumbnail browsing view. Switch to file browsing view for a quick view of all available files. If your Philips TV still does not recognize AVI files from the USB device, you also can try to convert AVI to MP4 for Philips TV playback with some video converters. Pavtube Video Converter Ultimate, as the best Philips TV converter, is winning more and more credit. With it, you can easily convert MP4, MKV, AVI, MOV, WMV, FLV, AVCHD, MXF, VOB, RMVB to Philips TV more supported video format with no efforts to play video on Philips TV. Besides AVI, you also can rip Blu-ray and DVD to Philips TV compatible video format. You also can add subtitles to video for Philips TV and replace audio in video. How to Get AVI work with Philips TV via USB? Step 1. Click "File" button to add your video files to the program. Or directly drag the video you want to convert to the left item bar. Step 2. Set right output format. Click “Format” bar, and select .mp4 from “Common video” or “HD video”. Or choose the format from “TVS”. Step 3. Click the “Start conversion” button on the main interface and the software will start to convert video to Philips TV friendly video formats immediately. When the conversion finishes, click “Open” to find the converted video files. Then you can effortless transfer the video files to play .avi files on USB stick directly to Philips TV. How to Stream ISO Images to Sharp TV via USB/Over Network? Next → Next post: How to Play H.265 Video to Philips TV? How to Play H.265 Video to Philips TV? How to Play M2TS/MTS on Philips TV?